The CH-53K Super Stallion heavy-lift helicopter is being developed to replace the CH-53E helicopter. Image courtesy of Sikorsky Aircraft Corporation. The CH-53K helicopter will have a maximum gross weight of 33,566kg. Image courtesy of Sikorsky Aircraft Corporation. The CH-53K helicopter will is expected to achieve initial operational capability with the US Marine Corps in 2019. Image courtesy of Sikorsky Aircraft Corporation. The Sikorsky CH-53K Super Stallion heavy-lift helicopter is being developed by Sikorsky Aircraft to replace the CH-53E helicopter of the US Marine Corps (USMC). The USMC plans to acquire 200 CH-53K helicopters. The Super Stallion can be fielded from amphibious assault ships for the transportation of personnel and equipment. It will also be used to carry external cargo loads. The aircraft can be operated from austere and remote forward operating bases. The new helicopter will feature improved payload, range, and hot-high capabilities. It is expected to deliver reliable and cost-effective, low-maintenance and survivable solutions in all conditions. Sikorsky secured a $3.5bn system development and demonstration (SDD) contract from the US Department of Defense in April 2006, for the development, systems integration, production of test helicopter, and testing and evaluation of the helicopter. Rockwell Collins was awarded a contract in June 2006 to provide an avionics management system for the CH-53K helicopter. In December 2006, GE Aviation was selected to provide three GE38-1B turboshaft engines. Hamilton Sundstrand was selected to provide an auxiliary power unit (APU), environmental control system (ECS) and the main engine start system consisting of an air turbine starter and start control valve. Sikorsky selected a Fuselage Team in May 2007 to design and build the major fuselage sections of the helicopter. The team consists of Aurora Flight Sciences, EDO Corp, GKN Aerospace, and Spirit AeroSystems. The first APU light-off test was conducted in August 2010. The CH-53K prototype aircraft is expected to perform its maiden flight in late 2014. 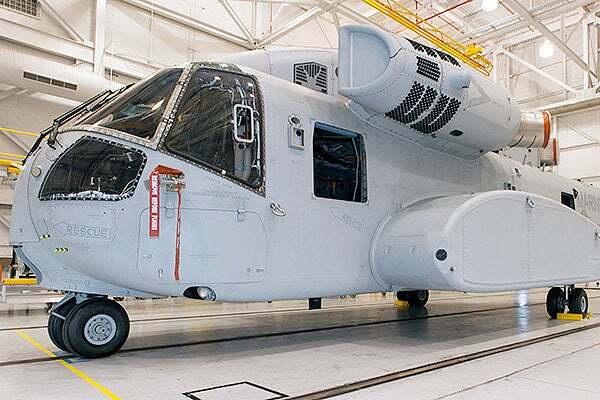 A new facility was opened at the Florida Assembly and Flight Operations (FAFO) campus, in March 2011, to perform CH-53K’s experimental assembly line operations. Assembly of the CH-53K Ground Test Vehicle (GTV) began in June 2011 and the first GTV prototype was delivered in December 2012. A total of seven prototype helicopters will be built and delivered during the system design and development programme. The four prototypes will be deployed as engineering development vehicles, while the other three will serve as dedicated ground test vehicle, static test article and fatigue test platform. The Naval Air Systems Command (NAVAIR) placed a $435m contract with Sikorsky in May 2013 to build four production-representative CH-53K helicopters, designated as System Demonstration Test Articles (SDTA), for the USMC. The deliveries are scheduled to conclude in March 2017 and the initial operational capability is planned for 2019. Spirit AeroSystems was awarded a $60m contract in June 2013 to provide major structural cockpit and cabin components for the SDTA aircraft. In October 2013, Kratos Defense & Security Solutions received an $8.5m contract to design and develop maintenance training systems. The CH-53K will employ tip-to-tail technology in a new hybrid composite airframe for additional payload and range capability. The fuselage will incorporate lightweight armour and crashworthy retractable landing gear. The helicopter will feature elastomeric main rotor head integrating 10ft long fourth generation rotor blades with advanced airfoils, upgraded engine system, cargo rail locking system, external cargo handling enhancements, and enhanced ballistic protection and survivability systems. The maximum gross weight of the helicopter will be 33,566kg, whereas the maximum alternate gross weight will be 38,419kg. The joint interoperable glass cockpit of the CH-53K will provide the operators with additional capabilities and situational awareness. It will accommodate a pilot and a co-pilot, and three combat support crew members. It will be equipped with a fly-by-wire flight control system and improved electrical systems. The CH-53K will feature crashworthy seats for occupants. Its cabin measures 9.1m in length, 2.7m in width and 2m in height. The cabin area and volume will be 24.6m² and 9.1m³ respectively. The integrated avionics management system (AMS) of the CH-53K will provide advanced flight planning and navigation capability. It will be equipped with fully integrated active matrix liquid crystal multifunction displays, dual integrated processing cabinets, dual control display units and dual data transfer units. "The CH-53K will employ tip-to-tail technology in a new hybrid composite airframe for additional payload and range capability." The other equipment and systems will include a digital moving map, forward looking infrared (FLIR) system and electronic countermeasures. The AMS ensures the management of primary flight instrumentation, display systems, vehicle operational characteristics, civil and military flights and navigation and communication systems. The CH-53K helicopter will be powered by three General Electric GE38-1B turboshaft engines controlled by a dual-channel Full Authority Digital Electronic Control (FADEC) system. The GE38-1B comprises a five-stage axial compressor mated with a single-stage centrifugal compressor. It is also equipped with an annular combustor, two-stage gas generator turbine, and three-stage power turbine. The engines are rated at a maximum take-off power of 13,748kW and will ensure stall-free performance in all conditions. The CH-53K will have a maximum cruise speed of 315km/h and a maximum range of 841km. The helicopter will have hovering in ground effect ceiling of 2,902m, hovering out of ground effect ceiling of 969m, and one engine inoperative (OEI) service ceiling of 2,213m. The all engine operable service (AEO) ceiling of the helicopter will be 4,383m.